Palestinian terrorists in the Gaza Strip fired two rockets at Israel Tuesday evening, one of which was intercepted over Ashkelon by the Iron Dome missile defense system. The second rocket hit open territory in the Hof Ashkelon Regional Council. There were no reports of injuries or damage. Ashkelon residents who did not hear an alert before Iron Dome intercepted the incoming rocket took the explosion as a matter of course. "There hasn't been a rocket fired at the city in a long time, but we hear sonic booms from planes and sometimes in the south of the city we can hear what's happening in Gaza," Benny told Ynet. "I'm happy that Iron Dome works, that even in a situation in which we're in danger it manages to keep our lives quiet and peaceful." Last month, the Hamas' military wing's website published an interview with Ahmed Ikram Salami, an operative who was released by Israel in April after nine years in prison. Salami revealed that at the beginning of the al-Aqsa Intifada, there had been plans to build Qassam rockets in the West Bank, after the technical knowledge had been transferred from Gaza. 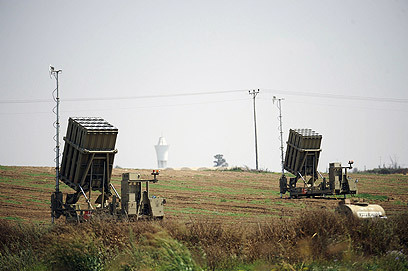 See all talkbacks "Iron Dome intercepts rocket over Ashkelon "